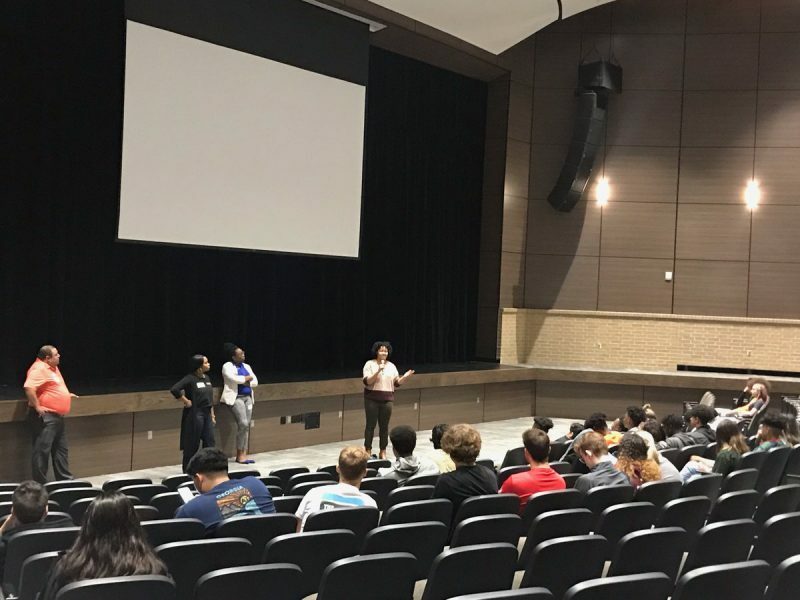 Presenters talk to Klein Cain high School juniors while helping get bearings on life after high school. Here at Klein Cain, the Hurricanes After High School event was hosted on Nov. 8 for Juniors during school hours. Twenty-one different trade schools, colleges, and universities were in attendance to give presentations at the school. Those students who attended were informed by presenters of the various options that are available to them following graduation. It is time for students who are planning on continuing their education to start thinking about their options. This includes taking the SAT, ACT, and applying to colleges that spark their interest and are within their price range. There are many affordable options to get started in higher education, such as Lone Star College, with a campus just down the road in Tomball, Texas. Students who are looking at colleges should take location and cost into account when narrowing down their choices. The University of Houston Downtown is a low-cost four-year university that is great for students looking to stay close to home. With the University of Houston Downtown students can choose from 52 different academic programs offered. Tuition at UHD is the lowest in the region, priced at only $220 per credit hour for students. Students interested in applying to UHD should note that the university accepts applications on September 1st. “As a student at University of Houston Downtown you have the opportunity and time to have a life outside of school,” Jamil Thorne, one of the admissions counselors at UHD, said. Sam Houston University is an option for those students who want to stay close to home. Here students will be able to attend a four-year university at a low cost. That is especially true if they are a Texas resident. Students who will need assistance paying can receive financial aid, grants, loans, and work-study programs. Some students here at Klein Cain may decide that they will not be continuing on to college. For those who think college is not for them, there are a number of affordable trade schools available to them. These offer students training for jobs that can support them without needing to attend a four-year college. United Flight Systems offers flight training for those who simply want to learn or those who intend to use their skills for a career. Furthermore, UFS has trained hundreds of pilots. Many have continued on to work for an airline or fly as a hobby. Most importantly, pilots are heavily sought-after due to a massive shortage of them worldwide. Anyone who was to fly 1500 hours with UFS would be able to get a job within a few days. Their partnership with Express Jet guarantees a conditional job offer to UFS students that complete the program. To qualify for this a person must accumulate 1500 hours with United Flight Systems. Academy for Dental Assisting is ideal for anyone who wants to work alongside a dentist in pediatrics, general dentistry, surgery, or orthopedics. Academy for Dental Assisting will be offering one class each week to their students. On top of that, they must perform an eighty-hour internship at a dental office. One of the requirements for this program is that applicants must be a high school graduate. This program offers opportunities and training to students for a low price that cannot be found anywhere else. Klein Cain students who would like more information about these programs may contact Klein Cain High School’s counseling staff via their website. You can also check our article on good study habits while you’re focused on preparing for the path ahead. Featured image from Klein Cain Counselors twitter account.